At Carriage House Manor & The Cottages we are continually looking for qualified individuals who can bring the best quality of life for our residents. Our associates are our most valuable asset. We’re searching for top-notch associates who also believe their calling is to care for the elderly community. To inquire about available positions, please fill out the form below. 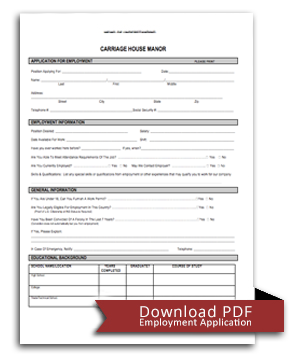 You can also DOWNLOAD the employment application form and submit it to us by mail.